Having soft, smooth, and shiny hair does not have to be difficult and expensive. 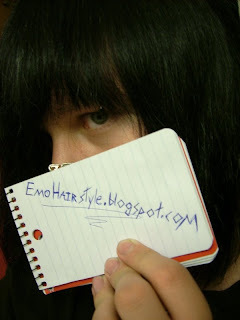 Just follow these few simple steps and you will have beautiful and luxurious emo hair in no time. First, brush your hair several times a day. Brushing helps remove the dirt, dust, and grime that get trapped in your hair. It also helps distribute the natural oils produced by the scalp, from the roots to the tips. Shampoo your hair every other day and condition it everyday. Shampooing on a daily basis may strip off the natural oils that moisturize the hair. Conditioning it, on the other hand, restores lost moisture and keeps the natural oils in place. Use cold water as much as possible when washing your hair. This seals the hair cuticles and locks the conditioner as close to the hair follicle as possible. Give your hair a hot oil treatment once every two weeks. Mayonnaise or egg yolks can be used as an alternative to expensive salon treatments. Spread mayonnaise or egg yolks combined with olive oil all over your hair, concentrating on the ends. Cover your hair with a shower cap for 10-20 mins and then rinse well. Eat lots of food rich in B-vitamins and proteins, like bananas, soybeans, avocados, eggs, grains, and red meat. The nutrients found in these food items are responsible for healthy and shiny hair. Refrain from using heated styling tools and alcohol-based styling products as much as possible, as this can easily dry out your hair. If it cannot be avoided, use thermal styling tools and water-based styling products, which cause less damage to the hair. Lastly, have your hair trimmed every six weeks to keep it in tip-top shape. This gets rid of the dry ends and keeps the rest of the hair looking good and healthy. As far as what i do to style it, for the old haircut (1st pic) I used to comb it all down and straighten it in front of my face, then comb it kind of over my right eye and with the other bang to he left side and re-straighten it in its new position (thick wavy hair doesn't like to cooperate) Then for spiking out the back when the mood struck me, i'd kind of run my fingers up the back of my head and pull out the water after a shower to sort of sudo-dry it in that position already, then when straightening came i'd straighten it straight up, and finally I'd add some texturizer and run my hands up through the back and pull out ward, we have a closet in my house where you can see behind you so i'd usually use that to check for missed spots, don't add too much or it'll fall down, then usually once i got it staying nice and up I'd use the left over Texturizer on my hair to smooth it out and kind of hold it in place, my hair is thick so i'd basically pancake my bang between my palms and smoothen it out. then add a bit of hairspray to the back to hold it in place. For my new hair I'm still experimenting The back is cut so I can spike it out But I've decided to go with wax to spike it which i'm still experimenting with (hence why i have no pictures of that) If you have really long hair i'd suggest some type of wax, simply because it has structure and seems less like lethal spikes than gel, and texturizer would barely help and you'd be holding everything up with hairspray alone otherwise. However it would be a similar idea, running your waxed fingers through you're hair and pulling outwards to make all of the hair stand up, for the front and sides, i pretty much just straighten them and add a bit of texturizer to hold them in place or Depp anti-frizz depending how staticy my hair is. For the bangs I simply straighten everything out and comb it into place so it blends nicely. once it grows a bit further i'll be able to do a fore head showing part but at the moment it doesn't work out to well. 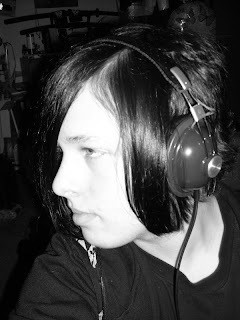 So there is what i did for my old hair and what i do for my new haircut... theres actually a story behind my old haircut and the transitions it underwent before i got it as i liked it..then lobed half of it off lol. 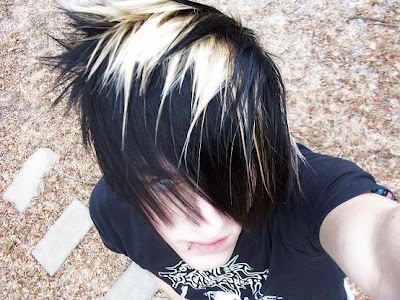 This emo boy has the most awesome hair. Agree?